I have spent the better part of my twenties working 80-hour weeks on an endless cycle of corporate deals. It is at 3am during one of these weeks of sleep deprivation that I realise I need a new hobby. Something to relax. Something that doesn’t involve waking up at 5am, riding a bike and sweating litres in a dark room full of strangers. Something that isn’t reading the comment threads beneath YouTube videos. I’d tried life drawing, but doodling penises lost its novelty after a few sessions. I’d tried print making, but found the studios too cold and industrial, the chemicals dizzying and the cleaning off-putting. I’d tried pottery, but again, there’s a lot of cleaning. I needed something cosy, something starkly different to the Kafkaesque procedures of my working life. Knitting had always to my mind been a domestic pursuit, mainly practised by an older generation of women who had been taught the craft before the advent of the second wave of feminism. The only people I knew who knitted were my grandmother and her sisters. While I enjoyed watching these women twirl wool into rows of connected loops, clicking their needles in soothing, rhythmic patterns, I was an ungrateful recipient of the end results. They were hideous and itched around the shoulders. Nonetheless, having almost run the gamut of the art and craft scene, I decide to try knitting. When I begin my foray, big things are happening in the world of knitting. Yarn stores are popping up everywhere, the top knitting Instagrammers are gaining 1000′s of followers and Danish designers riding the Hygge wave are making tidy profits on their patterns. The first time I enter a yarn store, I’m met by a cosy-looking shop assistant reading the latest copy of Mittens of Latvia. She guides me through the wall of wool and needle sizes, advises me to follow a pattern, and encourages me to join a knit night (a social gathering of knitters). Once home, I scan the pattern. A mystifying collection of random number and letters. “CO”. “Ktog”. “M1”. “C2R”. “C2F”. “C2L”. Like many crafts, knitting has its own language. A language comprised of indecipherable acronyms. Doubt sets in. How much time will it take to learn this language? It is at this point I realise that knitting is hard. Knitting is a craft. After a few rows of knitting and purling, my fingers begin to recognise the choreography. With each twirl of the yarn and dip of the needle, my confidence grows. I learn how to create new stitches. I learn how to cross 2 left and cross 2 right. I learn the meaning of magical terms such as “purlwise”, “seed stitch”, “slip stitch” and “turning a heel”. Encouraged by this progress, I decide to attend a knit night. I leave work early (6pm) amid accusatory stares from co-workers and make my way to a cosy, narrow, two-storey yarn store. The knitting circle, a hodgepodge clan of knit-wear clad ladies and two men, welcome me into their fold with discrete smiles and slight nods. The main topic of discussion is a recent yarn fair, the price of yarn and the Real Housewives, all carried out without interruption to the swift and expert clicking of their circular needles. I’m worried the circle will judge the comparably clumsy manner in which I wield my needles. But no-one seems to notice or care. There are no awkward introductions, discussion of professions or relationship status. Vague references are made to partners, but only as ancillary actors in stories that centre around knitting ambitions and the next project. Three weeks into my knitting foray and I’ve finished the beanie. Worn it. Photographed and Instagrammed it. The sense of achievement has overwhelmed me. In a profession where my labour rarely bears tangible outcomes, as in things I can see, smell, feel and touch, I am oddly proud of my imperfect, hand-made beanie. Addicted to the feeling, I’ve immediately decided to move on to mittens. I finish a row and hold up my almost finished mitten for inspection. It is at this point that I discover my mistake. A small, misshapen hole. I sigh and weigh up the options. I have two choices. One: Ignore it and live with the imperfection. Unthinkable. Two: Patch it. Live with it and the knowledge of shoddy craftsmanship. An inelegant solution. Still, I decide to patch it and continue. In the end, the mittens turn out slightly too small. Obviously, there was and still is a third option. Option three is start again. Starting again means hours of work with nothing to show for it. Starting again means more work, with the same materials and without guaranteed success. Starting again means admitting imperfection. But starting again also means shedding the unwearable. Starting from a clean slate. I cut the finishing knot on my first mitten and begin to undo the stitches. At some point during this knitting experiment, I quit my job. 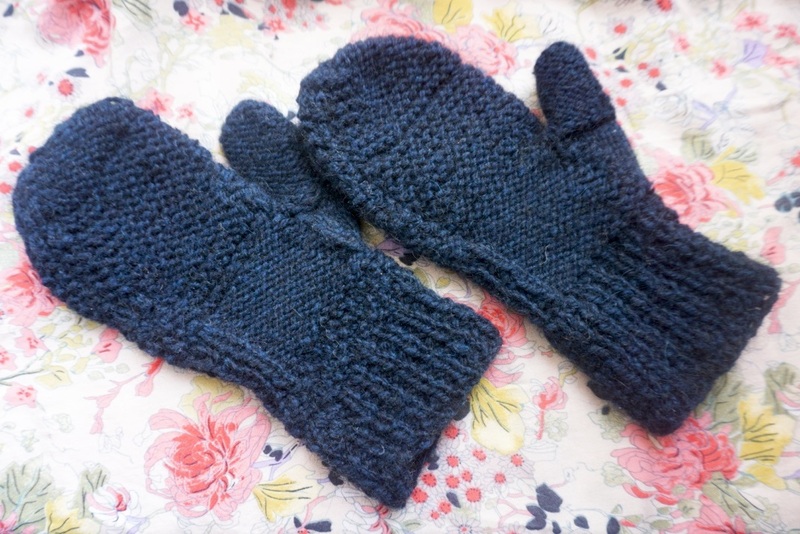 While knitting didn’t compel me to make the decision, it did help me understand why. If I can’t tolerate a pair of ill-fitting mittens, it would be ludicrous to continue with an ill-fitting job that takes up 80% of my life. Of course, we can’t all quit our jobs and open Etsy stores. The world does need corporate lawyers (or just more female members of the profession). But we can try to spend more of our time learning new things, finding communities and creating things we like. And if the glove really, truly doesn’t fit, we can start again. So, do you have an Etsy store? This entry was posted in Life and tagged career, crafting, life, memoir. Bookmark the permalink.